From one point of view, small spaces can be frustrating. They seem to get cluttered so easily and it’s hard not to feel claustrophobic. However, you don’t have to feel that way. From another point of view, small rooms present an interesting design challenge. 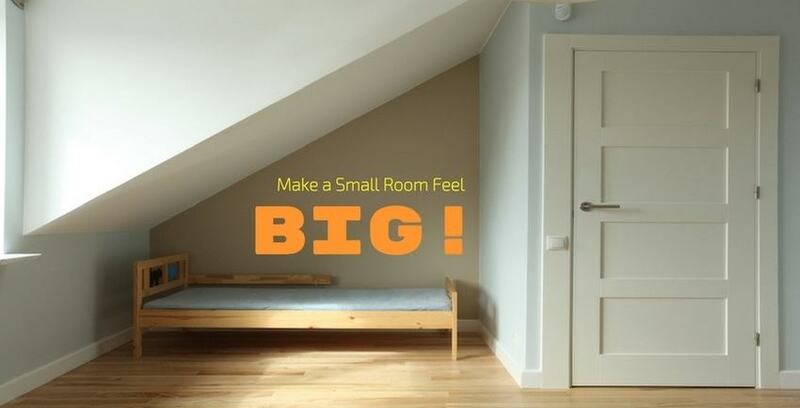 What can you do to make that room feel bigger and more comfortable? How can you maximize the space you have and fit more inside the room without it feeling too busy? Storage Direct has some experience maximizing limited space, so we’ve put together a few of our favorite design ideas for making small rooms feel bigger. Even if you only incorporate a few of these tips into your interior design, you might be surprised at how much roomier and more comfortable a small room feels. Hanging a mirror or two as a decoration will help make a small room feel a lot bigger. Not only will the reflection suggest more space, it will also help brighten the room by reflecting light. The great thing about using mirrors is you can create a lot of different effects if you get creative. If you angle the mirror or use it to reflect a particular object in the room, you can create an illusion of depth. By hanging mirrors on adjoining walls, you’ll be able to look at the room from several different perspectives. You could also hang a mirror on an existing piece of furniture and add all the advantages of having mirrors in a room without taking up any additional space. It turns out that one of the best ways to add more space to a room is… add more space to the room! If you can add a few rows of shelving, you’ll have a place to put more stuff without cluttering the space up too much. If you affix hanging shelving to the walls, you can direct the eye upwards, which will also make the room feel bigger. Be careful not to overdo it on the shelving, however. Too many shelves can end up making a room feel busy, like it’s a storage space. Try to use shelves to display things you want to look at, and have a theme for the shelves you use. Don’t just put random sets of things on your shelves; that’s a surefire way to make a space feel disorganized, which is exactly what you don’t want. One great way to get more closet space and make a room feel less cluttered is to install a clothing hook or bar in your bedroom. Instead of hanging your clothes up in your closet, hang them up out in the open. Like a lot of these other ideas, you’ll get the best results if you get a little creative. For instance, you could choose to hang only your favorite clothes or matching outfits you’re particularly fond of, sticking with the closet for the rest. Alternately, hang up clothes that match the room to make an attractive decoration and conserve space at the same time! The idea is to make the room feel unique. Bright artwork and decorations will also help you create a distinct character. Use a small room to create a new, different, and intriguing aesthetic environment; a change of pace from the rest of the home. Changing things up like this will make the room feel refreshing instead of constrictive, so you won’t feel as claustrophobic in it. Plus, you won’t be thinking about the size of a room if you’re thinking about how darn stylish it looks instead. Light is probably the single most essential thing for making a space feel bigger. Big windows, mirrors, bright furniture and decorations, and light paint or wallpaper are all good ways to get a room to open up. Dark walls and furniture can be cozy, but they also tend to make rooms feel smaller. You don’t want to feel like you’re in a cave when the sun goes down! Lamps are a simple way to add light, but they’re not always ideal. Yellow-ey, incandescent light doesn’t look natural, so it can make a room feel tighter or even cramped. Instead, look into natural sunlight camps or fluorescent lighting. Obviously, natural light would be the best, so if you have a window in your small room, don’t shut it out with blinds! You could even position a mirror so that it reflects the window, bringing the outside “in,” so to speak. If you’ve ever watched an episode of anything on HGTV, you know all about this. Everything is “open concept this” and “open concept that.” Well, there’s a reason: it works. If you can maneuver furniture or even knock down doors and walls to open up a space and give you more room to move around, a room will feel a lot bigger and… well, more open! You don’t have to go crazy with the sledgehammer, either. Sometimes, opening up a room can be as easy as removing a couple pieces of superfluous furniture or re-positioning a house plant so it’s a little more out-of-the-way. If your couch is currently occupying the middle of a room, try moving it to the wall instead. If you have any appliances or electronics sitting out freely, consider finding them a home inside some storage furniture. See? Playing around with the potential of small spaces can be kind of fun. All you have to do is expand your mind! …Get it? Expand, like, you’re making it bigger? …You know? …We’ll stop now. It probably sounds obvious coming from us, but another way you could make more space in your house is by storing your stuff somewhere else. If you want to declutter your life and get organized, consider finding a storage unit that works for you and giving us a call today.